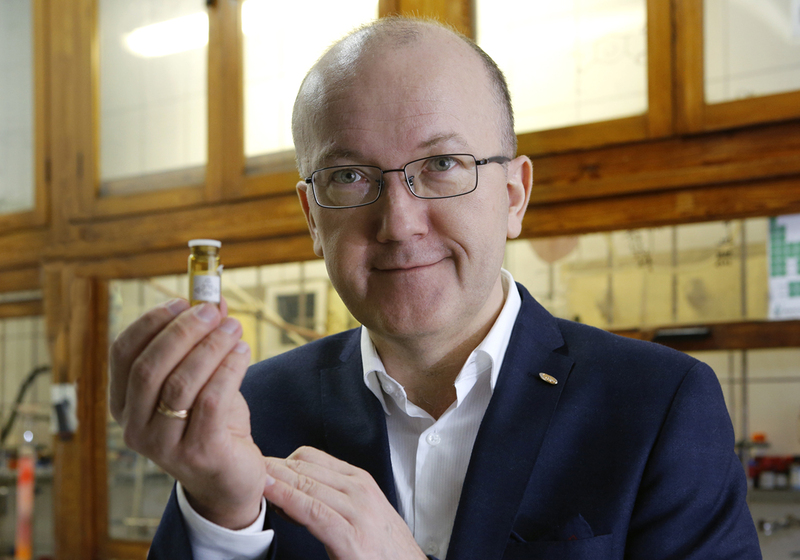 Prof. Daniel Gryko from from the Institute of Organic Chemistry of the Polish Academy of Sciences in Warsaw has received the Foundation for Polish Science Prize 2017 in the chemical and material sciences for the development of an original method for synthesis and characterization of porphyrinoids. Born in 1970, Daniel Gryko graduated from the Faculty of Chemistry at the University of Warsaw. He obtained his PhD at the Institute of Organic Chemistry of the Polish Academy of Sciences, where he also obtained his postdoctoral degree at the age of 33. He completed a postdoctoral fellowship at North Carolina State University in the United States in 1998-2000. He has worked as a visiting professor at the University of Burgundy in France and as a visiting researcher at Texas State University in Austin. He received the title of full professor in 2008. During this period he also worked at the Warsaw University of Technology for five years. Today he is a research worker of the Polish Academy of Sciences and heads a research group at the PAS Institute of Organic Chemistry. Although he takes part in many international projects, he has consistently carried out his research in Poland. Young scientists from other countries come here to work with him. His great scientific achievements have won him an award from the Society of Porphyrins and Phthalocyanines (2008), the Prize of the Minister of Science and Higher Education (2012), the Wojciech Świętosławski Prize awarded by the Polish Chemical Society (2013). He was a beneficiary of the Foundation for Polish Science’s MISTRZ academic grant for professors (2013). In addition, he has twice received a grant in the FNP’s TEAM programme. The professor has published about 240 scientific papers in journals such as Angewandte Chemie, Journal of the American Chemical Society and Chemical Communications, including a dozen or so overviews. His works have been cited almost 4,700 times. He has delivered over 40 lectures at conferences and about 70 at university-level schools, including Harvard and Caltech. He has registered many patents. The Foundation for Polish Science Prize 2017 was granted in recognition of Prof. Daniel Gryko’s achievements in synthesizing corroles and porphyrins and studying their photophysical properties. Prof. Daniel Gryko’s field of research is the chemistry of porphyrins, particularly corroles, which are organic dyes with multiple applications. Prof. Gryko designs and synthesizes such compounds. He has developed an effective method to obtain them, opening up new prospects for their application. Prof. Daniel Gryko’s main achievement is a method of synthesizing meso-substituted corroles, especially ones that contain two different types of substituent around a macrocyclic core. This offers access to corroles whose properties can be changed and adjusted to different needs. They can also be attached to a surface or another chromophore in a specifically defined location. Thanks to this research, the coordination chemistry of corroles is seeing unprecedented development. Over the past six years scientists have obtained complexes with seventeen new metals. If it weren’t for Prof. Gryko’s work, such progress would have been impossible, because a sufficient amount of corroles would not have been available for research. Prof. Gryko’s achievements have opened the way to many potential applications. Water-soluble corrole complexes are raising hopes in medicine, as they could serve as catalysts for the decomposition of reactive nitrogen compounds in cells (related to Huntington’s, Parkinson’s and Alzheimer’s diseases). It was recently also proved that corrole complexes effectively destroy cancer cells. Some corrole complexes have been patented and are undergoing clinical trials. Porphyrins and their “relatives” corroles are strong light emitters. This is especially true of complexes with gallium and phosphorus. This property is invaluable when it comes to studying intracellular processes in molecular biology and also in medical diagnostics. The strong red fluorescence of corroles means there is a possibility they could be used as fluorescent probes. Porphyrinoids are responsible for two crucial life processes: reversible binding of oxygen in the blood and photosynthesis. Corroles prepared using Prof. Daniel Gryko’s methodology have also been used in research on carbon monoxide detection, oxygen reduction, photoelectrochemical cells etc. Although synthesis is Prof. Gryko’s field, he initiated a lot of research that resulted, among other things, in checking the usefulness of corroles in research on electron transfer and water oxygenation, their two-photon absorption, in obtaining the first lanthanide corrole complexes etc. Prof. Daniel Gryko’s methodology has become popular with researchers all over the world. He has expanded his field of interest to include chlorites, artificial photosynthesis, two-photon absorption and intramolecular excited-state proton transfer. His work has contributed to further research in all these fields.